Radiography is the standard observation tool for examining orthopaedic injuries. Point-of-care ultrasonography may thus be a faster, non-invasive alternative to effectively identify bone fractures in the emergency department (ED) setting. The study compares the diagnostic utilities of BUS and radiography for identifying long bone fractures. Prospective observation study with convenience sampling was conducted in ED in patients above 5 years, with post-traumatic upper and lower limb injuries requiring standard radiological examination after informed consent. The BUS examinations were done by emergency physician (EP) who had a brief training session to detect fractures. For every subject, radiographs were taken and reviewed for the presence of fracture by blinded orthopaedic specialist. Statistical analysis was done by SPSS. One hundred and thirty-three patients were enrolled in the study. Only 42 had fracture, out of which 36 were picked up by BUS. The overall sensitivity of the BUS in detecting fracture was 85.7% with a confidence interval (CI) of 0.70–0.94 and specificity of 100% with a CI (0.95–1.00).The positive predictive value (PPV) of USG was 100% with a CI (0.86–1.00) and negative predictive value (NPV) of 93.8% with a CI (0.86–0.97). There were six additional fractures which were recognised on X-ray and were not picked up by ultrasound. 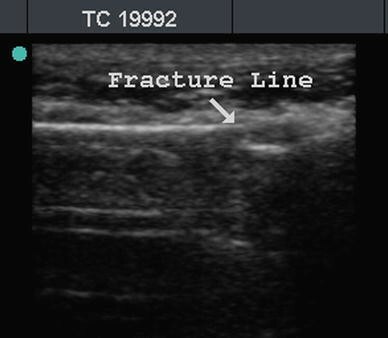 Point-of-care ultrasonography can be utilised by emergency physicians after brief training to accurately identify long bone fractures. It may gain a more prominent role in pregnant and paediatric population as well as in mass casualty scenarios. Radiographic examinations especially X-ray of chest and pelvis are adjuncts to primary survey of trauma resuscitation. Specific skeletal X-ray is a part of secondary or tertiary survey. During mass casualty or in a very busy day at emergency department (ED), this non-life-threatening skeletal injuries are kept waiting for hours for the want of the X-ray examination and subsequent treatment. Point-of-care (POC) ultrasound (USG) may thus be a faster, non-invasive alternative screening tool to effectively identify bone fractures in the ED setting. The study compares the diagnostic utilities of POC USG and radiography for identifying long bone fractures in the ED by emergency physicians (EP). A prospective, convenience sample study comparing the efficacy POC USG and radiography to detect fractures was conducted in ED with an annual visit of 50,000 patients of a level one trauma centre, New Delhi, India The project was approved by ethics committee of the All India Institute of Medical Sciences and there is no competing interest. Patients above 5 years, with complaints of post-traumatic arm, elbow, forearm, wrist, leg bones and ankle pain were included after informed consent from May to October 2009. Patients with of injury more than 72 h prior to presentation, previous fracture at the affected site, or evidence of an open fracture, femur fractures, spine or pelvic injuries, life- and limb-threatening injuries were excluded. POC USG examinations were done by four EPs one consultant emergency medicine, two senior resident orthopaedics and one senior resident surgery (not credentialed as a Registered Diagnostic Medical Sonographers) who had 1 day didactic followed by hands on training session to detect fractures. The EPs were only recruited after they performed 10 positive and 10 negative supervised scans to detect fracture. Before obtaining an X-ray, EP performed sonographic evaluation of the affected region using a high frequency (7–10 MHz) linear array probe after informed consent. The ultrasound probe was moved along the transverse (to detect “skip”) and longitudinal (to detect a defect in the cortex) planes to detect the presence or absence of fracture, and the EP recorded his/her findings (Figs. 1, 2). For every subject, radiographs were then taken and reviewed for the presence of fracture by blinded orthopaedic specialist. The images and interpretations of USG and radiography were then compared to determine the utility of POC USG at identifying fractures. The data were collected on a predesigned Performa and compiled on a excel sheet. Data were analysed using SPSS version 16 for sensitivity, specificity, positive predictive value (PPV), negative predictive value (NPV) with confidence interval of 95% for identification of fractures by POC USG. 133 patients were enrolled in the study with an average age of 29.8 years (7–70) years out of which 41 patients were up to 18 years and 92 patients were having age >18 years. Males were 96 and females 37. 78 (58.6%) fall from height, 42 (31.5%) road traffic crash and 13 (9.7%) assaults were the mode of injury. 42.8% were of upper limb trauma and rest 57.14% had lower limb injury (Table 2). 101 patients had point tenderness mimicking bony injury but only 42 had fracture, out of which 36 were picked up by ultrasound (details described in flow diagram). The overall sensitivity of the POC USG in detecting fracture was 85.7% with a confidence interval (CI) of 0.70–0.94 and specificity of 100% with a CI (0.95–1.00). PPV of USG was 100% with a CI (0.86–1.00) and NPV of 93.8% with a CI (0.86–0.97) derived from 2 × 2 table (Table 1). There were six additional fractures which were recognised on X-ray and were not picked up by ultrasound (Table 3). All of these injuries were from the elbow and knee region. This gives the NPV of 93.8% with a CI (0.86–0.97). If we remove the region involving elbow and knee then the positive and NPV becomes 100% and also the sensitivity and specificity of the tests increases to 100% (Table 1). Ultrasound was used for assessment of regenerated bone after Ilizarov distraction osteogenesis and enhancing fracture healing . It helped to localise the interposition of soft tissues between the fracture fragments preoperatively and to detect occult fractures not seen on the X-rays (i.e. occult knee, greater tuberosity and paediatric fractures) [2–7]. POC USG in ED has been used as a tool for fracture reduction successfully . Ultrasound-guided reduction of distal forearm fractures was performed by Emergency Physicians and they demonstrated that similar first-attempt success rate as compared to non-US-guided reduction . POC USG was able to diagnose around 85.75% of the fractures during the period of study. After excluding patients with injury primarily around knee and elbow our study showed 100% sensitivity and specificity and 100% positive and NPVs. A possible explanation of missing out of elbow and knee fractures could be (a) contour of the bone near these joints which make the diagnosis difficult and (b) not recognising and including the haemarthrosis or lipoarthrosis as criteria for suspecting fracture in our study. Studies which had also taken lipohaemarthrosis as criteria for fracture have diagnosed occult fractures in knee . Hübner et al. found good correlation for the fractures of the long bones of the upper and lower limb, but ultrasound was not reliable in compound injuries and fracture adjacent to joints, lesion of the small bones of hand and foot, non-displaced epiphyseal fractures (Salter-Harris type 1) or those with a fracture line of less than 1 mm. The results in this study although done in children are comparable to our study because the fractures that were missed in our study were also around the joints (elbow and knee) . This study as compared to ours has a small sample size and the sensitivity in our study was 85.7% with a confidence interval (CI) of 0.70–0.94 and specificity of 100% with a CI (0.95–1.00). PPV of BUS was 100% with a CI (0.86–1.00) and NPV of 93.8% with a CI (0.86–0.97). In our study, if we would have excluded the elbow and knee trauma, we would have saved unnecessary radiation exposure to 84 patients in whom the POC USG and X-ray did not show any fracture. The authors believe that there can be larger use of POC USG in diagnosing or refuting fracture in mass casualties and also in austere environment  where X-ray examination may not be available or would be very busy. 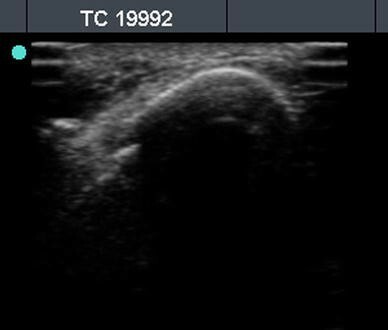 Point of care ultrasound missed six cases of fracture around elbow and knee joint. POC USG may miss fractures around joints; however, studies with larger sample size are needed to validate it. Point-of-care ultrasonography can be utilised by emergency physicians after brief training to accurately identify long bone fractures. It may gain a more prominent role due to its radiation sparing effect in pregnant and paediatric population as well as address the radiological surge capacity dilemma in mass casualty scenarios.